house of tallowwood and scandinavian simplicity. | owl's house london. house of tallowwood and scandinavian simplicity. Situated in a very typical, coastal Victorian landscape of scrub and tea trees, this house is designed around a courtyard, blurring the lines between outside and in. Throughout, Japanese and Scandinavian influences are evident, from the simple, open plan layout to the beautiful detailing, influx of light, and restrained palette of textures and tones. The L-shaped building surrounds the courtyard, with master bedroom at one end, and the children’s bedrooms at the other. Between, the open-plan living space leads out onto the terrace, partially sheltered by the overhanging roofline. 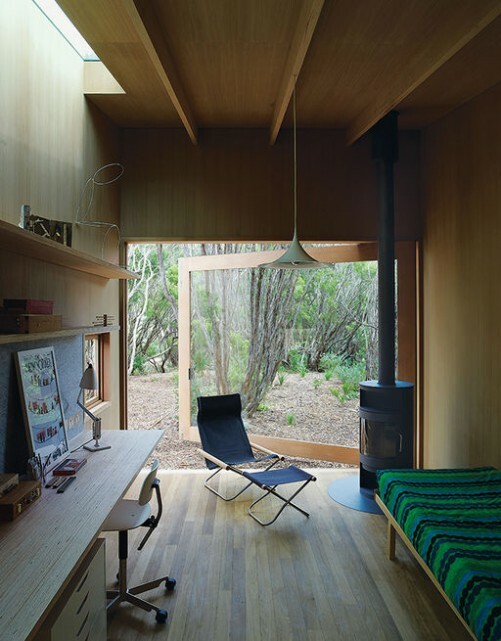 In a separate pavilion, a studio and guest room is the ultimate garden room, with a fully openable window wall, wood burning stove and high-light windows. 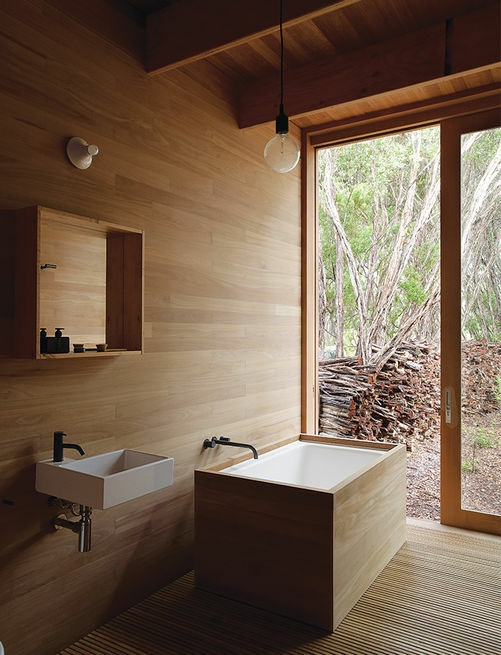 All of the surfaces are lined with wood – a beautiful, pale, honey coloured indiginous eucalyptus called tallowwood. 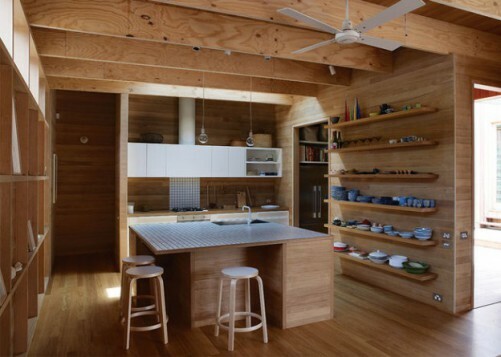 Exposed, laminated oregon beams form the roof structure, the lines continuing down to form a grid of shelving in the open plan living and kitchen spaces. 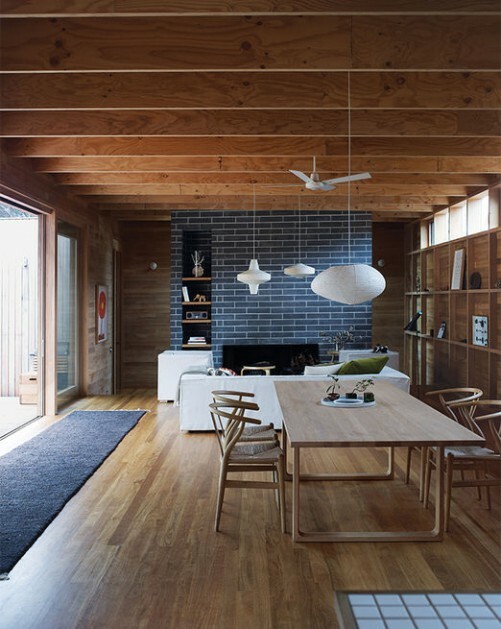 The focal point of the living space is a free standing, dark-grey brick chimney, which contrasts beautifully with the wood; the only other contrast comes from simple white joinery and white mosaic tiled kitchen benchtop. Everywhere, fully retractable windows open rooms up to the outside, with clerestory windows bringing even more light in. The simplicity of the design is underpinned by the simple lines of the Scandinavian furniture – Alvar Aalto daybed and stools, Hans Wegner Wishbone chairs, Nanna Ditzel hanging rattan chair and Marimekko textiles. The perfect weekender. Pirates Bay House, O’Connor + Houle. Photographs, Richard Powers. This entry was posted in wonderful spaces. and tagged Alvar Aalto, architecture, Hans Wegner, Marimekko, Scandinavian design on March 16, 2015 by owls house london.. Cool simplicity . I feel the need to de-clutter J !